A recent discussion among jazz researchers centered on the evolution of instrumentation as big bands changed through the decades. 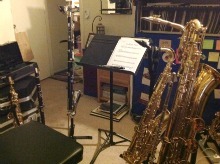 The conversation developed into exchanges about not only the makeup of band sectionsrhythm, brass and reedsbut also the matter of doubling, in which individual musicians played more than one instrument and sometimes several. In the 1920s and 1930s doubling was a requirement in many bands, among them Sam Gooding’s, Jean Goldkette’s, Jimmy Lunceford’s, Paul Whiteman’s, Glen Gray’s Casa Loma Orchestra and, notably, Fletcher Henderson’s. Take a look at the arsenal of instruments laid out before Henderson’s reed section in this photograph from 1924. Henderson is at the piano. That’s Louis Armstrong in the middle of the top row. Coleman Hawkins is at the left end of the saxophones. The trumpet in front of alto saxophonist Don Redman suggests that he doubled in brass. 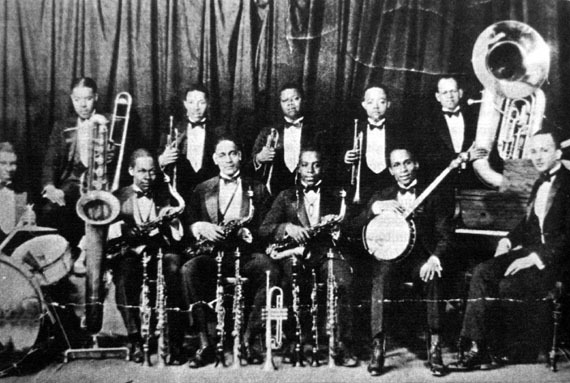 There’s not a lot of doubling apparent in Henderson’s 1924 “Sugarfoot Stomp,” but who cares?the piece has a long Armstrong solo, one of his first on record. Despite all of the opprobrium Paul Whiteman brought on himself with the title King Of Jazz and his declaration that he wanted to “’make an honest woman out of jazz,” his popular success and the rewards it brought made it possible to expand. He sometimes included French horns, tuba, strings and extra percussion, setting an example that inspired other big bands. Here’s a Whiteman piece with the kind of arrangement and instrumentation that drove much of the criticism by purists. Wait for a solo by Armstrong’s Chicago jam session pal Bix Beiderbecke that makes the track indispensable. In the photograph that accompanies the recording, Bix is third from the left in the middle row. Doubling continued though the twentieth century; think of the Thad Jones-Mel Lewis Orchestra and the Bob Florence Limited Edition. It is alive and well in the 2000s. For evidence, listen to (and watch) the Uptown Lowdown Jazz Band at the 2010 America’s Jazz Festival in Lacey, Washington, a suburb of the state capitol, Olympia. The piece they play goes back to nearly the beginning of jazz. This may be one of the few times you’ll see three bass saxophones trading phrases and engaging in simultaneous improvisation. Bert Barr, leader, cornet; Rose Marie Barr, piano; John Goodrich, reeds; Paul Woltz, reeds; Pieter Meijers, reeds; Tom Jacobus, trombone; Al LaTourette, banjo; and Paul Hagglund, tuba. Thanks to Andrew Homzy for his lead to that video. 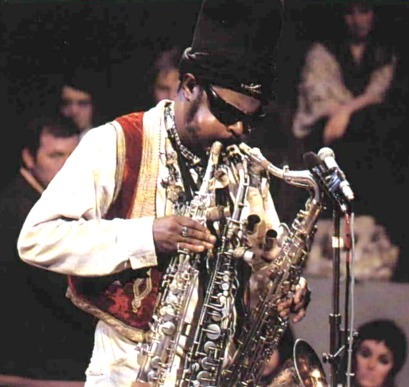 Apart from big bands, there was Roland Kirk, who doubled, tripled and sometimes quadrupled, simultaneously. Fascinating reading (as always) plus such listening treats! The Whiteman Orchestra piece (is that a celeste in the mix?) is a tad too cutesy (all those different sections one after another). The real fun was hearing those 3 bass saxophones. In the list of the personnel, some deserving reed player does not get named. Otherwise, that’s a lot of heat from a trad band. The third bass saxophonist is Pieter Meijers. The ID comes from Uptown Downtown leader Bert Barr. Mr. Meijers’ name is now added to the personnel list. While you’re at Mr. Sherr’s website, be sure to click on his bio and other links at the top of the page. Be prepared to stay awhile. Fascinating stuff. Fun! But, I’m betting there were never 3 bass saxophones on stage before at one time, ever. Though Garrison Keillor did feature 2 in a cutting session one time. Right off the top in the Uptown Downtown video, the reeds are a straight soprano, a curved soprano, and, is the far right instrument a Cmelody sax, rather than an alto? Kinda looks like it…and it would be suitable for the period of that music. Think of Frank Trumbauer. (And Scott Robinson, who made a lovely CD featuring that saxophone).